It’s been the most beautiful autumn I can remember. The stillness of each reluctant dawn. The drama of the sunrise, turning the world from grey to lemon, gold to rose. The vast, v-shaped skeins of pink-footed geese heading for the salt marsh, rowdily honking, like teenagers en route to a party. 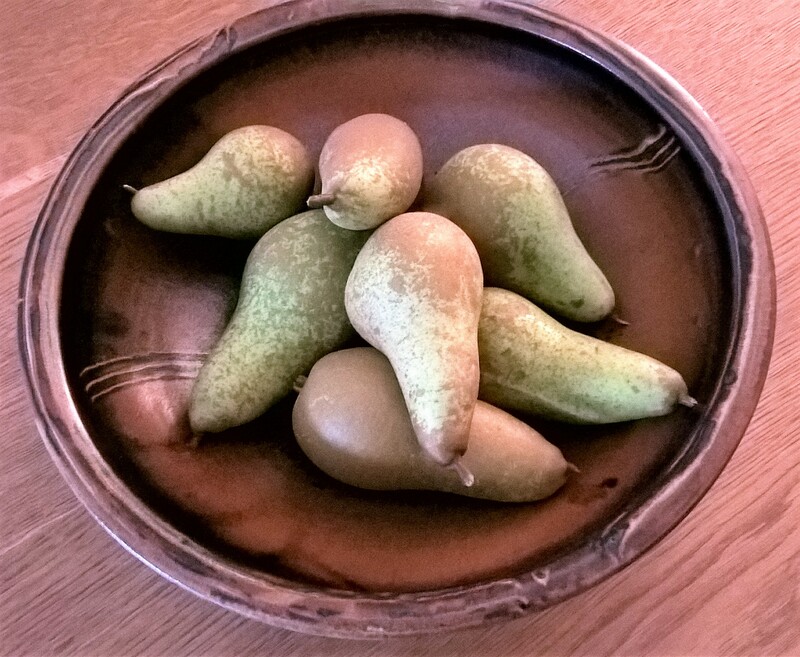 The luminous yellow leaves of the pear trees, espaliered against the drab fences of our small back garden, their mottled fruit juicy and ripe after time in the bowl indoors. The rowan trees lining the cul de sac, branches weighed down by luscious clusters of crimson and orange fruit. 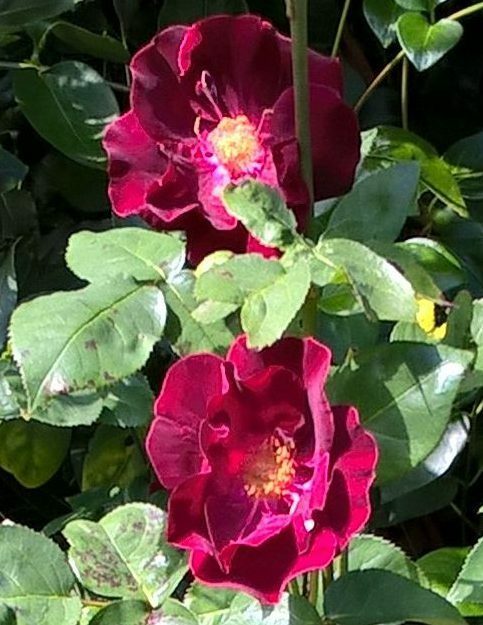 And now, sheltered against our back fence, beneath the path of the red squirrel, skittering its way to a peanut feeder meant for the birds, the very last roses of summer. ‘Dusky Maiden’ is boasting two brave blooms. Crimson petals, yellow stamens. Small, delicate, simple. Defying the season. In a perfect line of sight for me when I lift my eyes from my desktop. There have been walks. In a nature reserve, cached in a former brickworks. 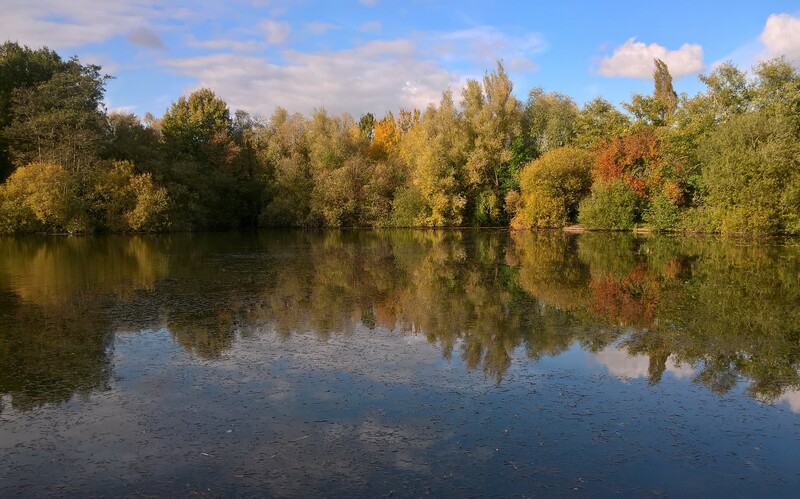 Trees decked out in their finest finery, gaudy cascades of gold and bronze, reflected in ponds swimming with resident waterfowl. People and dogs, birds and insects, fungi and flowers – all manner of life is here. There have been strolls on the vast sandy stretch of our local beach, tears rolling from my eyes as the cool wind catches the corners. Yesterday was a tromp in our local nature reserve, pine trees soaring above us, roots of evergreens, birches and beeches ribbing the bare sand beneath our feet. Marram grass holding the dunes together. Stabilising the human world. For now. And there have been such sunsets. Nature’s been wielding a swashbuckling paintbrush these last few weeks. But the moon is not to be outdone. A moonset last night had me gasping with delight. A juicy orange segment slipping down to the smooth curve of the golf course, dipping behind it – and suddenly – expired. Gone. 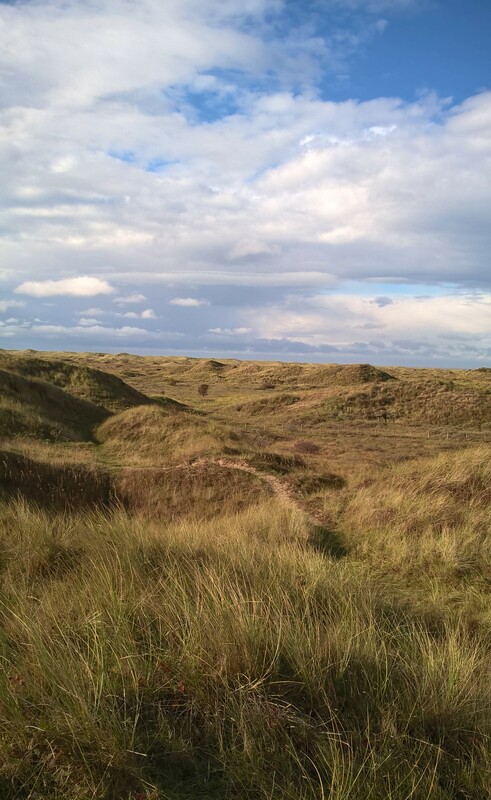 The only clue left, a sliver of amber light, silhouetting the slope of the manicured, marram-grassed sandhills. Later, we sat out on our little balcony swaddled in wool, begloved and behatted. We watched the stars turn from vague speckles on a not-quite-dark-yet sky to glittering pinpricks in a cloth of inky indigo. And amid all this beauty – what? Bursts of creative passion and words tripping off my fingers and onto the screen? Once indoors the dimmer switch has been turned. My mind wanting out. But there’s nowhere to go. It’s proving dispiriting for me, this autumn. Don’t get me wrong, I’m aware how lucky I am, to be born in this affluent world, a child of loving parents, educated by good schools and cared for by a free health service. Married to a wonderful man. I’m aware how well my life has gone so far, how much I have to look back on that’s good and fun and even – some of it – worthy. The other day someone who knows me well was chatting about some younger folk of our acquaintance. A five year old, I heard, was itching to meet my husband. A man who knows about dinosaurs and bones and things? I’d be excited too! But it came at an unfortunate time. A time when I was realising that, not only have I graduated into the ranks of ‘invisible women’ (this is how I wrote it before) as far as strangers are concerned, I’ve also become a nothing as far as, well, non-strangers are concerned. I murmured something to that effect. And when she said, ‘yes, they just see us as appendages of our husbands,’ I was there before her, in my own head. She meant no malice. And I didn’t challenge it. She was right. And she’s a kind, loving person. She’s also a mother and a grandmother. Neither of which I am. She, I suspect, thinks I have retired from life. Though I’m not of retirement age. She thinks this, I suspect, because I ‘work’ from home. I tell her what I’m ‘working’ on, but it feels like an exaggeration. Because my ‘work’ is writing – and I’m not a success. Not by the world’s standards. Not by my standards. I have no book deal. No agent. Finished novels languish on my desktop for want of confidence in their saleability. I published one myself – only to discover how bad I am at self-promotion. Unfinished odds and ends languish in optimistically named folders on data sticks and laptops. Unfinished because I know I have no agent, no deals, no chance – in my own head – of being published. My last paid freelance work was a drop of rain in a desert. I’m not actively seeking freelance work –but that’s beside the point. Yes. I once was. I once did. I always feel sorry for folk who say ‘I used to be’ when asked about themselves. But now, I’m there. An ‘I was’, not an ‘I am’. Unless I admit to, resort to, being an appendage. Late middle age is our autumn, isn’t it? And next, of course, comes winter. I will regroup, don’t worry. Spring, after all, is just a few months away. 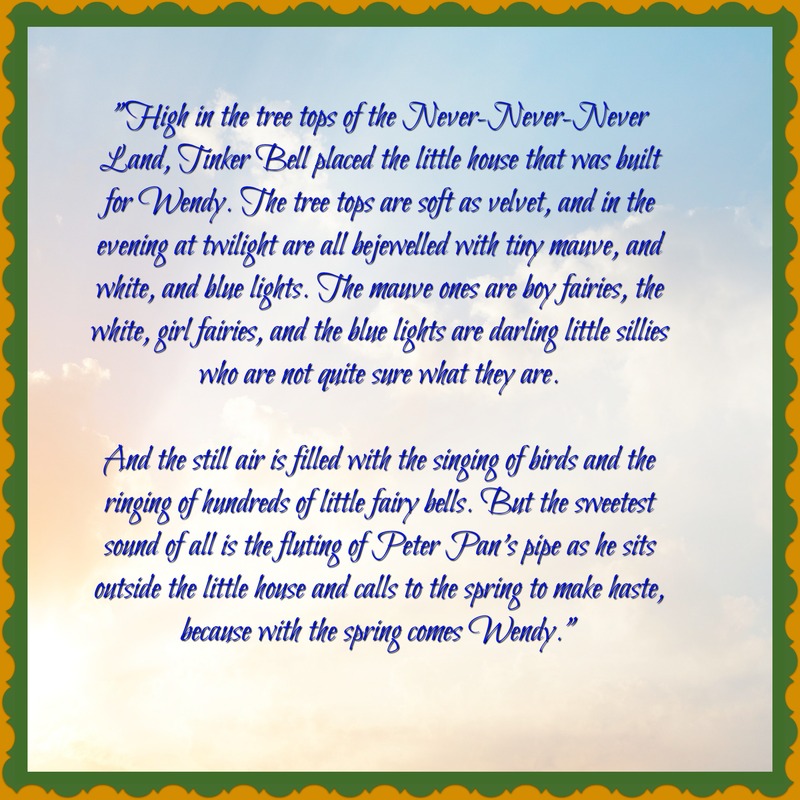 And with the spring comes Wendy 😉 or even … well, let’s just wait and see. Hope, as they say, springs eternal. 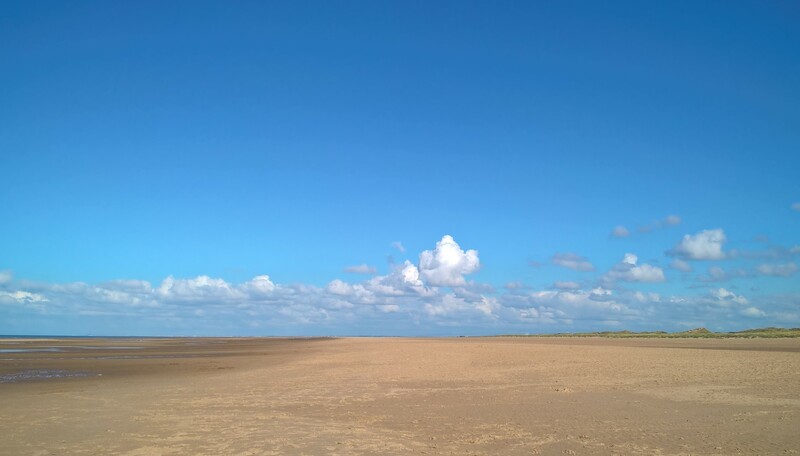 This entry was posted in Art, jaunts & going out, Lancashire & the golf coast, Thinking, or ranting, or both and tagged ageing, beaches, beauty, hope, murmuration, sand dunes, spring, starlings, trees, Wendy Darling, winter. Bookmark the permalink. I loved the video. One of my favorite times is when the birds migrate. I may be working in the yard and I hear the distant honking of geese. I’ve been lucky enough to witness flocks of ducks settling onto a wetland In the late afternoon. Close enough to feel the whoosh of wind from their wings. Ricardo reminded me that anthroman once plucked turkeys, made haggis and delivered mail! Life happens. All the best to you. Nice description – ‘whoosh of wind from their wings’. The pink footed geese are amazing this time of year, flying in long skeins over towards the marshes in the evening and back towards the beaches further south or inland to Martin Mere (we went there when you were over last time I think) in the morning in the pale light of dawn. They honk as they fly – though the bird book describes it as ‘unk-unk wink-wink’!The starlings apparently do the murmurations each evening for two to three weeks at this time of year at this particular location – very frustrating though as there are 2 lakes and there’s no predicting which they will perform over – or both! It was a privilege to be there. PS Anthroman actually enjoyed that postal job in the depths of a rare snowy London winter – he was still doing his PhD then and it made a change from sitting indoors typing sentences and then deleting them! The turkey plucking was his equivalent of my blood factory job though. Both were short-lived and unpleasant and the memories live on in our nostrils for ever more! Thanks Liz. It’s a beautiful place, so close to the M6 but you’d never know it, between Preston and Clitheroe. It happens for 2-3 weeks this time of year in the evenings between 4/4.30. Hey there. Being a grandparent isn’t always like the idyllic scenes pictured in Norman Rockwell paintings. Last weekend my five-year-old grandson dropped his drawers and mooned me each time he beat me in a game of Wii and, as an added bonus, offered to fart in my face. To be honest, I never thought it was idyllic and I didn’t intend to give the impression I was envious of those who are grandparents. It’s just that it does (arguably) present a more valid reason for being alive to some people than writing stuff! Thanks for dropping by and painting this picture for me! YOU *ARE* A SUCCESS. I’m nobody whose opinion you might value — another self-described invisible (ironically, the post through which I first discovered your blog). But I do know enough about writing and life to declare you a success. Your words stir me, Mary. I’m in awe of how you fill entire canvases with your words, as if mirroring Nature’s swashbuckling paintbrush. And although someone else may nod knowingly and describe you as an appendage of your husband, I do not see that. Through your writing I see only your keen mind and your wonderful powers of observation and description. 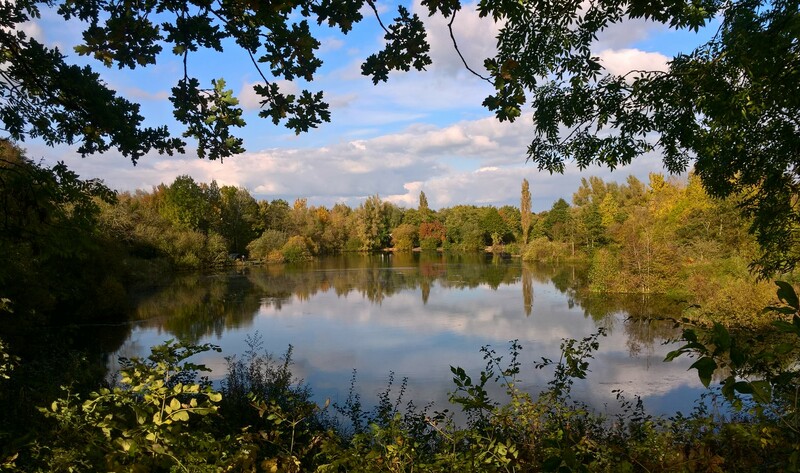 So yes: Do contemplate autumn, with its cruelties and injustices and its rich gifts. But keep your eye on the horizon … because spring, after all, is just a few months away. You read the post how I meant it – and responded perhaps more sympathetically than I deserve for this self-indulgent outpouring! But it is the blog of my life as it is now, thus these things will inevitably come out unless I suppress my feelings. As you (and I ) know after all this time, there will be downs but there are also lots of ups. The red squirrel I call Zippy just made a dash for the trees after sitting on the fence, grasping the fence post with his little pink fingers and sniffing the air – I don’t know why he ran. The world is always posing questions, it’s when I stop trying to answer them I get dejected. I kind of hope that if other people are feeling this way it might make them feel better too to know they’re not alone. I know how lucky I am, but that doesn’t mean I accept the status quo! Thank you, so much, for your very kind words, H. Mary. Hope! Yes, Mary. Hope. And love as well. Those are the ideals we must embrace. PS: Your photos and your video were also glorious. I did watch until the very end, and it gave me goosebumps. Thank you for sharing that wondrous moment. Wasn’t it amazing? I felt privileged to be there. Glad to see you are still writing! A lovely descriptive piece that makes me sad I have missed so much of this autumn through the pressure of family business. Sorry I missed a chance to meet up this week, I was recuperating a hectic October with a few unexpectedly mild days in the white villages of Andalusia but back now to the the shock of a cold, damp November! Missed you on Wednesday! But it wasn’t exactly a cheerful occasion 😦 Comforting for me to be with Peter and Sally though. Andalusia sound divine – but then so does Sweden where I am headed for a brief trip shortly. Hope to see you next time and hope the world calms down a bit for you personally and for us generally.